You might know Sarah Christianson by the way she makes the neighborhood sunnier. She’s been working in the neighborhood for about three years. When an apartment showed up on Craigslist two blocks from her job as a studio manager for Jim Campbell* we took a peek. Love! It was home before we could move in. The first apartment we had picked together, and soon enough** I was on my knee in front of our bricked-over fireplace and her parents. She said yes. Everyone cried. One of the gifts she has given to me has been a perspective on place: physically, socially, emotionally. You are where you feel. Dogpatch feels like home now, in ways that I hadn’t been able to satisfy in other towns or states. I could talk about meat from Olivier’s or my new sweater from TAD***, but those are just things. Dogpatch is the people: the folks behind the counters and peeking over the backyard fences, the ones who nailed board to beam and laid brick on block. Our home in Dogpatch is our emigration. We moved to California as part of a gold rush. I’m panning for pixily gold in the sluices of the internet, and she’s been exposing silver prints at Rayko. She left the North Dakota farm her family built in 1884 for an Italianate structure built in roughly the same year. 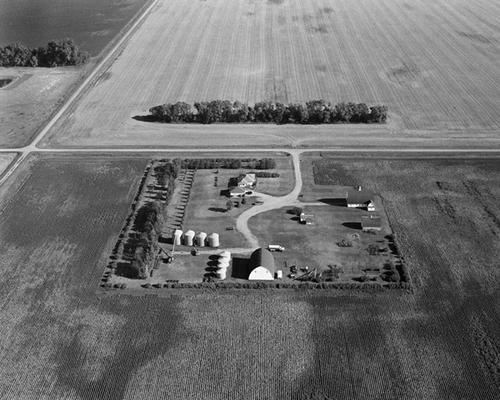 That farm is the subject of Sarah’s upcoming book to be published by Daylight in 2013. 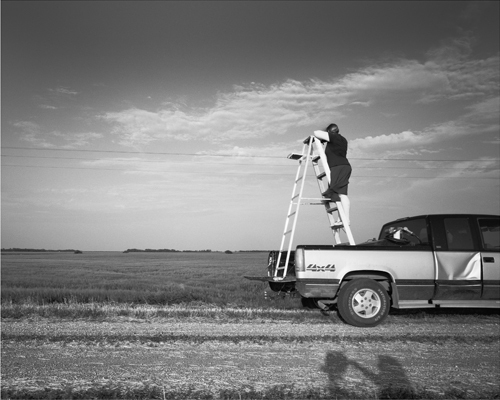 It’s the culmination of six years of work: before, during, and after her MFA in photography. Home, for me, will always be a 1200-acre farm in the Red River Valley of eastern North Dakota. Its original 160 acres were homesteaded in 1884 by my great-great grandfather, a Norwegian immigrant. My parents are now the fourth, and last, consecutive generation to work our land, as my siblings and I (like so many other young people) have all moved away to pursue other careers. These circumstances provided me with the impetus to document our farm and its origins in Norway at this critical juncture. I combine my images with materials from my family’s archive, such as documents and snapshots, to create a rich multi-layered narrative. Just as different layers of texts intermingle on reused ancient manuscript pages, the history of our farm is marked again and again on the land as a palimpsest. As world populations shift from agrarian to urban lifestyles, our small family farm is only one amongst many that are approaching a crossroads. What will happen to them? Who will maintain these traditions and what does this tradition mean? If you look very carefully at the following image, you can see the same telephone pole 65 years apart. Everything else has been razed or eaten****. Modern publishing being what it is, Sarah and I have to pay up front for a lot of the production and printing costs. As such, she is taking contributions through indiegogo. Your contribution will yield some nice perks, like the book itself or gelatin silver prints. The indiegogo campaign ends in just a week, so your chance to reserve a signed, numbered early edition is slipping away! You can see Sarah’s work on her website: http://sarahchristianson.com/. You can see some in person at Gilberth’s Rotisserie, where it is on long-term loan. She also has two pieces in the upcoming show: “Transient States” which opens Friday, July 13, 5-8 pm at SF Camerawork, 1011 Market Street on the second floor and runs through August 25th. Sarah and I will be married on her parents’ farm in less than a month, drawing an arrow from this home to that. I am a little suspicious that she is staging the wedding as a piece of performance art, but since she won’t let me put the honeymoon money towards the book, I think it’s for real. * You can see Jim’s work in the atrium of SFMoMA until October 2012. ** not soon enough for her, which is a long and funny story you are welcome to ask about over a beer any time. This was written by Jesse Mullan. Posted on Monday, July 9, 2012, at 9:30 am. Filed under Photos, Art. Tagged Sarah Christianson. Bookmark the permalink. Follow comments here with the RSS feed. Post a comment or leave a trackback.